AMRO Director Junhong Chang and ADB President Takehiko Nakao have signed a MOU to strengthen cooperation in support of members in ASEAN, the People’s Republic of China, the Republic of Korea, and Japan. 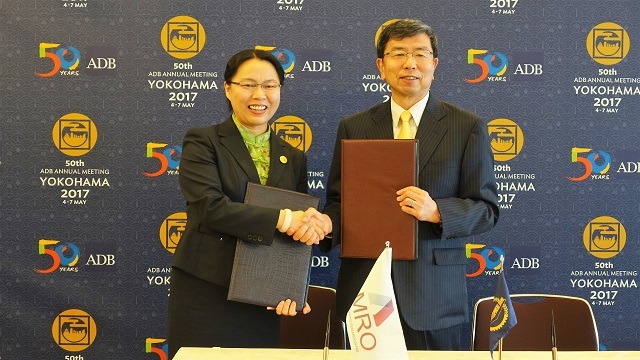 YOKOHAMA, JAPAN, May 3, 2017 — The ASEAN+3 Macroeconomic Research Office (AMRO) and the Asian Development Bank (ADB) today signed a memorandum of understanding (MOU) to strengthen cooperation between the two institutions in support of members in the Association of Southeast Asian Nations (ASEAN), the People’s Republic of China, Japan, and the Republic of Korea. The MOU was signed by AMRO Director Junhong Chang and ADB President Takehiko Nakao on the sidelines of the 50th Annual Meeting of ADB’s Board of Governors in Yokohama, Japan. Through the partnership, AMRO and ADB will collaborate to support efforts and policies focused on economic growth, greater financial stability, and improved cooperation and integration in the ASEAN+3 region. The MOU will help enhance the two institutions’ support to further strengthen the region’s macroeconomic surveillance, as well as its crisis prevention and management capabilities. Since its inception in 2011, AMRO has sustained a strong partnership with ADB, including activities such as the annual Asian Regional Roundtable, a host of meetings and dialogues at both leadership and working staff levels, as well as ADB’s technical assistance to strengthen AMRO’s surveillance capacity. The MOU is a milestone in enhancing and institutionalizing the cooperation between the two organizations following AMRO’s new status as an international organization. AMRO, located in Singapore, is a regional surveillance organization that aims at contributing to the regional macroeconomic and financial stability through conducting macroeconomic surveillance and supporting the implementation of the regional financial arrangement. AMRO members include 10 ASEAN economies and the People’s Republic of China (including Hong Kong), Japan, and the Republic of Korea.